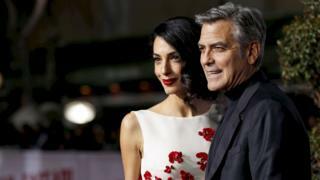 Amal and George Clooney welcomed their first children into the world on Tuesday. The twins - a girl and a boy - have been named Ella and Alexander. Congratulations poured in when the announcement of the birth was made, but some were puzzled by their choice of names. "George and Amal Clooney gave their twins nice normal names? Isn't that a violation of celebrity rules?" asked one of many fans who took to social media to share how pleasantly surprised they were by the couple's choices. While there's nothing wrong with an unusual name, the rich and famous often tend to go that one step further. Here are some of the most bizarre and brilliant celebrity baby names from recent years. Where better to start than right at the beginning of the alphabet? "A is for Apple" is a very familiar phrase indeed to parents trying to teach their kids the alphabet, but it also proved inspirational to Chris Martin and Gwyneth Paltrow. The pair, who "consciously uncoupled" in 2014, have a 13-year-old daughter by the name of Apple. The name caused Robbie Williams to get into a bit of a verbal tangle during one encounter with the family, as he told Graham Norton in 2012. During a party he was throwing, the singer asked Paltrow at the buffet: "Does Melon want some Apple?" Bear may not be too out of the ordinary - but it is certainly a name you remember. And, as Liam explained last month, that's precisely why he and Cheryl chose it, although not without a bit of debate. "I wanted a more traditional name and she wanted a name that was more unusual," he said. "And the reason she chose Bear in the end was because Bear is a name that when you leave a room, you won't forget. And I like that." It probably also helps that Liam is a big fan of Bear Grylls, who he described as "a boss" on Twitter after the birth. Kim Kardashian and Kanye West welcomed their first baby in 2013. Fans speculated for months about what the pair would name their first-born, bearing in mind that the child would probably take Kanye's surname. The couple delivered a name better than anyone could have hoped for - North. Which makes their daughter's full name North West. News of the name was particularly welcomed by those in Lancashire. Kardashian's mother Kris Jenner said after the birth: "The way Kim explained it to me was North means 'highest power', and she says that North is [Kim and Kanye's] highest point together. And I thought that was really sweet." The Wests followed it up by naming their second son Saint in 2015. No pressure on him to be well behaved, then. Beyonce and Jay-Z made headlines in 2012 when they named their first born daughter Blue Ivy Carter. They even tried to trademark the name, but the rights had already been granted to Boston-based wedding firm Blue Ivy Events. There's a theory that Ivy was chosen because of the couple's fondness for the number four, which is IV in Roman numerals. Blue was actually a more common name at one stage - famous Blues include author Blue Balliett, born in 1955, and NBA player Blue Edwards, born 1965, though both are nicknames. And while Beyonce and Jay-Z may have given the name a new lease of life, they weren't the first celebrity couple to choose the colourful name for their offspring. U2's The Edge chose the name Blue Angel for his daughter, who is now 27. Princess may be a term of endearment many parents use for their daughter, but fewer choose it as an actual name. That didn't deter Peter Andre and Katie Price from giving the name to their daughter in 2007. But perhaps even more unusual is the second part of her name - Tiaamii. Peter and Katie came up with the name by merging the first names of their two mothers - Thea and Amy. Full marks for creativity, although Pete did reveal in 2014 that their daughter said she didn't like her name. No feature about celebrity baby names would be complete without a mention of the Beckhams. Their unusual choices include Brooklyn, Romeo and Cruz for their sons and Harper Seven for their daughter. The names were mocked by some though. Brooklyn in particular was singled out by Katie Hopkins as an example of a children's name she really disliked in her famous This Morning interview on the subject in 2013. We can't imagine the 18-year-old is losing any sleep over that though, he's a bit busy preparing for the release of his first photography book later this month. Brooklyn is far from the only celebrity child to be named after a geographical location. We'd be here all day if we started listing the celebrities who name their children after countries and capitals, so let's just single out a couple of examples. Shakira welcomed the first of her two sons with FC Barcelona player Gerard Pique in 2013, whom the couple named Milan. Then there's Michael Jackson's daughter Paris, Bono's daughter Memphis, Alec Baldwin and Kim Basinger's daughter Ireland and Alicia Keys's son Egypt. Ramsgate is still available, should any stars out there still be on the lookout. Jamie Oliver. A national treasure, a talented chef, a recognisable TV personality and the absolute king of unusual names. His youngest child with wife Jools is called River Rocket, with their other offspring called Daisy Boo, Buddy Bear, Poppy Honey and Petal Blossom. We take our hat off to him for the sheer creativity of these delightful names - and his consistency deserves a special mention too. There's alliteration with the boys (Buddy Bear and River Rocket) and a flower-based theme for the girls (Daisy, Poppy and Petal). The Oliver tribe aside, there must surely be plenty more weird and wonderful celebrity baby names to come in the months and years ahead. When exactly is Beyonce due to give birth to those twins...?